Well it has been a very quiet winter for the Trotter Racing team with plenty of luck, unfortunately all bad!. However, it is onwards and upwards as we put the misfortune behind us and target our small team towards summer time racing, especially over the busy Christmas/New Year period. It was very disappointing that our highly talented city galloper Plot The Course sustained a track work injury that required surgery and a lengthy time on the sidelines. Thankfully he had a successful recovery and is expected to trial in the coming weeks. Unfortunately we lost Grangemouth suddenly from a heart attack after completing light exercise at track work back in May. This was a tragic end for such a kind and honest gelding who always gave his best in his 9 starts for the stable running no further back than 5th. If ever a horse deserved to win a race it was him. Rounding off the bad luck we took Empire Liberty and Reconciled to races as 2 year olds for their racetrack debuts hoping for a positive experience first time out. Both came home battered and bruised physically and mentally with Reconciled galloped on and forced to the paddock and Empire Liberty continuing on to gain confidence after nearly been put through the fence on debut. Both of these young horses are close to trialling and have shown good ability during their first preparations to suggest that they will be well placed and competitive when they return this time in. Brave Maddie is all set to return after a nice jumpout this week. The now 4 year old Host mare failed to come up last time in after a promising first campaign. She maybe back as early as Cup Day at Cranbourne provided she gains a start. Her half brother Cyclone Tim has had a couple of educational preparations and is nearing a jump out. A mini replica of his city winning half brother Cyclone Andy the now 3 year old has returned a much more settled and mature gelding. The last of our 3 year olds Sophie an unraced filly by Strategic has recently commenced work after been given plenty of time to mature. Her initial jump outs earlier this year showed she had good talent but just needed to strengthen up more before being asked to be pushed along on the training track. We have a lovely Wanted 2 year old Super VOBIS gelding broken in ready to go (pictured). 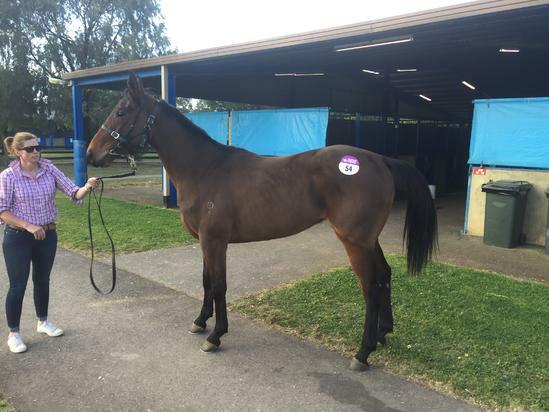 He is a 3/4 brother to promising stayer Dandre and is an affordable prospect for any one that wants to be part of our boutique stable. We look forward to getting our team back to the races in the coming weeks.